(1) Editorial: Corruption Undenied - A whistleblower for the DEA shared a far different perspective on the opioid crisis which many have incorrectly blamed on chronic pain patients who use medication. It's a shameful moment where the US Senate & Congress placed corporate interests ahead of the health of the people. Please join us as we fight for compassionate pain care. 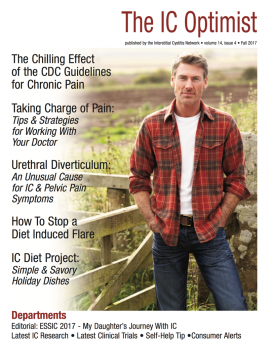 (2) The Chlling Effect of the CDC Guidelines for Chronic Pain - At IC support groups across the country, more and more patients are sharing stories about how they have been cut off of pain medication despite the fact that they have used it successfully, in low doses and with no signs of addiction. We share important history of how the guidelines were created and our own survey results. We're in fight here but there's hope. Chronic pain advocates and doctors around the country are actively petitioning the government to rewrite the guidelines. We also share patient stories. (3) Taking Charge of Pain: Tips & Strategies For Working With Your Doctor - Are you struggling to talk with your doctor about pain care? Are you being told it's all in your head? Are you worried about the examination? Afraid of treatments? We share our best tips and strategies on working with your care providers about your IC. (4) When Bladder Treatments Don't Work - If you've tried everything and you're still not better, then it's time to take a fresh look at your symptoms. 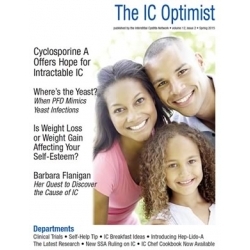 We review the often subtle differences between the five IC subtypes that could point you in a new and far more effective treatment direction. 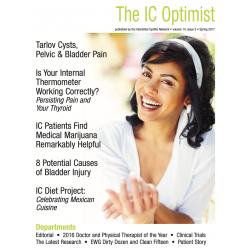 (5) Case Study - An Unusual Cause of IC & Pelvic Pain Symptoms - In this case study, we share the story of a patient who had tried IC treatments for more than ten years with no luck but then a nurse had a hunch. She ordered a cross section pelvic MRI which found the real problem, a urethral diverticulum. The patient is now symptom free and effectively cured. She's proof that you should never give up! (6) Self-Help Tip: How To Stop A Diet Induced Flare - It's the holidays and you just were so good. You avoided the cranberries. You stayed away from the wine. But then Grandma brought out her amazing chocolate cake and you couldn't say no. Hours later a dreaded bladder wall flare hits! We share easy tips to nip that flare in the bud! New stem cell study has encouraging results & more! (7) The Latest IC Research - The hot new IC/BPS research studies including a new test urine which can reliably predict Hunner's lesions. Wouldn't it be great to not have to have invasive testing! Another study shows that bowel injury can trigger bladder symptoms. (8) ESSIC 2017 - My Daughter's Journey With IC - Gail Benshabat is determined to improve the care that IC/BPS patients receive in Canada. We sponsored her appearance at the ESSIC 2017 meeting in Prague so that she could share her daughters story. 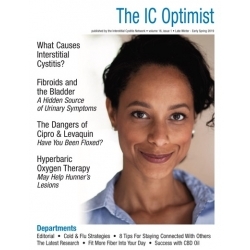 (9) How To Qualify For Disability Benefits With Interstitial Cystitis - Disability expert Bryan Mac Murray explains the two different types of disability benefits in the USA and how to apply. He talks about the qualifications and how to proceed if you are denied. Appeals work! (10) Clinical Trial Announcement - The Leadership 301 Trial is seeking men and women in the USA, Canada and Europe to participate in a clinical trial for AQX-1125. (11) IC Diet Project: Simple & Savory Holiday Dishes - IC Cookbook authors Bev Laumann and Julie Beyer share recipes for some simple holiday dishes easy on the bladder yet filled with comfort and joy!